In 1105, six years after the first crusaders from Europe conquered Jerusalem, a Damascene Muslim jurisprudent named ’Ali ibn Tahir al-Sulami (d. 1106) publicly dictated an extended call to the military jihad (holy war) against the European invaders. Entitled Kitab al-Jihad (The Book of the Jihad), al-Sulami’s work both summoned his Muslim brethren to the jihad and instructed them in the manner in which it ought to be conducted, covering topics as diverse as who should fight and be fought, treatment of prisoners and plunder, and the need for participants to fight their own inner sinfulness before turning their efforts against the enemy. Al-Sulami’s text is vital for a complete understanding of the Muslim reaction to the crusades, providing the reader with the first contemporary record of Muslim preaching against the crusaders. However, until recently only a small part of the text has been studied by modern scholars, as it has remained for the most part an unedited manuscript. 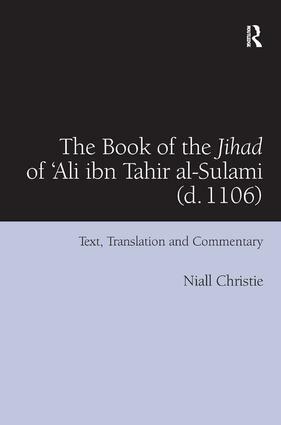 In this book Niall Christie provides a complete edition and the first full English translation of the extant sections (parts 2, 8, 9 and 12) of the manuscript of al-Sulami’s work, making it fully available to modern readers for the first time. These are accompanied by an introductory study exploring the techniques that the author uses to motivate his audience, the precedents that influenced his work, and possible directions for future study of the text. In addition, an appendix provides translations of jihad sermons by Ibn Nubata al-Fariqi (d. 985), a preacher from Asia Minor whose rhetorical style was highly influential in the development of al-Sulami’s work. Contents: Preface; Introductory study.The Book of the Jihad of ’Ali ibn Tahir al-Sulami (d. 1106): Arabic Text: Notes to the text; Part 2; Part 8; Part 9; Part 12. The Book of the Jihad of ’Ali ibn Tahir al-Sulami (d. 1106): English Translation: Part 2; Part 8; Part 9; Part 12; Appendix: Jihad Khutbas of Ibn Nubata al-Fariqi. Glossary; Bibliography; Index. Niall Christie received his PhD in Islamic History from the University of St Andrews, Scotland, in 2000. He teaches the history of Europe and the Middle East at Langara College in Vancouver, Canada.